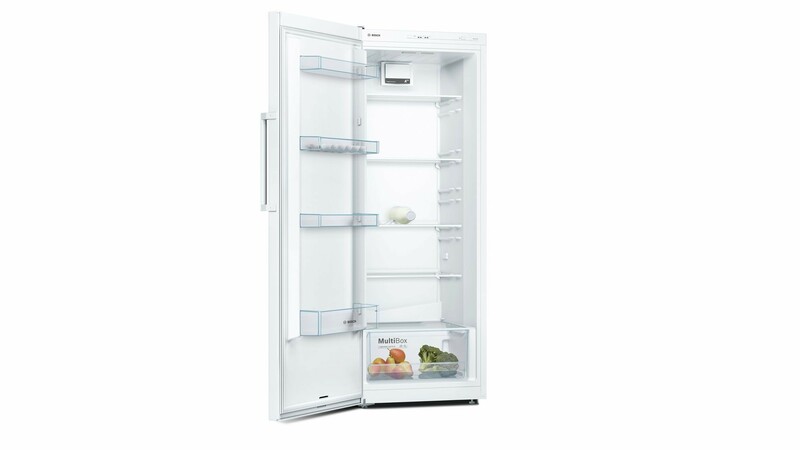 The tall Bosch KSV29NW3PG Fridge has a large net capacity of 290 litres and an energy efficiency rating of A++, making it spacious and kind to the environment. It has 5 shelves, along with a SuperCool function with automatic deactivation: simply press the button and the fridge rapidly reduces the temperature when new items are added, quickly cooling the new contents to 2°C. The SuperCool function is great when you have plenty of food to put in the fridge after a shopping trip, or even when the fridge is being opened more than usual, for example during a barbeque or party. The large MultiBox will keep all your fruit and veg fresher for longer. You also get a bottle rack for drinks storage, and 4 more door shelves for condiments and drinks. A bright LED light illuminates the interior of your fridge clearly, while Active Cooling offers quick and even temperature distribution on all shelf levels using an interior fridge fan. There is also removable magnetic door seals and height adjustable feet at the front.